Why would one aim off when navigating with a map and compass? Sometimes while navigating with map and compass, the advice is to aim off i.e. to aim either to the left or right of the intended destination, as opposed to straight for it. Why and when would one want to do this? The reason is that you could miss your destination and hit a trail and know that you are almost there, but not know which way to turn. 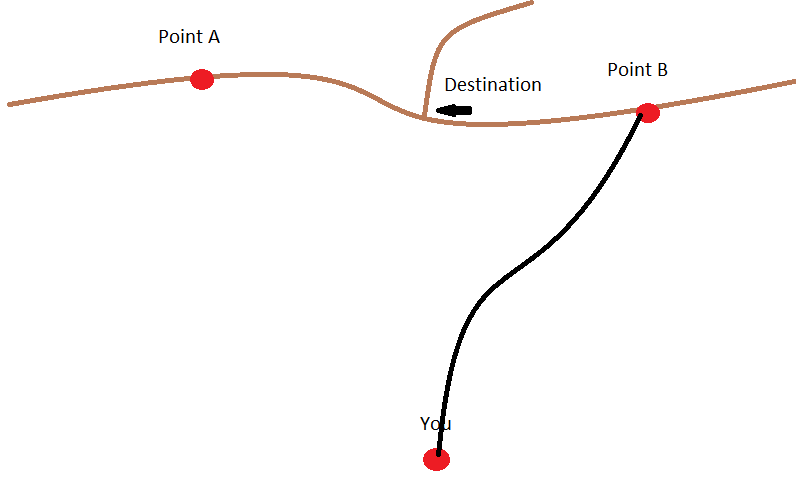 So if you were to go straight for the destination, and because of Murphy or errors or whatever and you ended up at either Point A or Point B, you wouldn't be certain of which way to turn to reach the trail intersection. If on the other hand you had gone for Point B in the first place, you would know that when you got there, you needed to turn left. That is why one would aim off. This works well when you are going for a single point on a well defined line like a trail or stream. The error is exaggerated for artistic purposes, but if you were to go for the destination straight off, your margin on either side is how far you would be able to see the destination from. On the other hand, while aiming for Point B, so long as one doesn't end up to the left of the destination, one is fine, and that is a much wider margin or error. 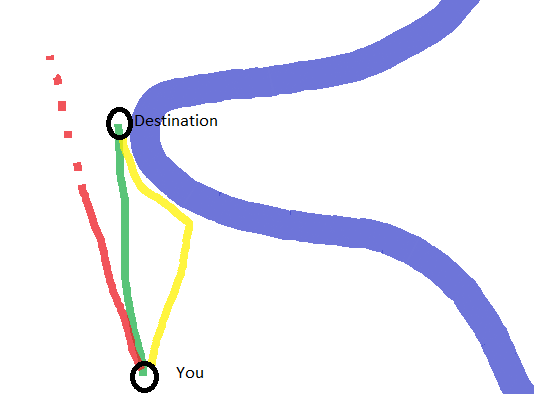 In addition to the case described by Charlie (and to show that I also can make drawings in Paint), there is the case where you want a stopping line to know when you are going too far. This is mainly useful when you are aiming for the end of a feature. The drawing below is with a river bend that you try to reach, but the same principle works when aiming for the end of a trail, the end of a fence, a turn in a path etc. Obviously, the shortest way is the green line. But what happens if you deviate slightly from it to the left or the right? To the right is not an issue, but if you unknowingly deviate to the left you will end up in the situation of the red line. You should be more or less at your destination, but have no idea if you are too far or should continue a bit further. You are lost. To avoid ending up lost, you will usually, on purpose, aim a bit to the right and follow the yellow line. It is a bit longer than the optimal green line, but you are sure that you will end up at the river. And once you hit the river you know that you should follow it a little to the left to end up at your destination. It is a bit longer than the green line, but at least you know that you will not end up in the hopeless case of the red line. I was in the Army Infantry in the '90s when we still used maps and compasses to get through the woods. People have a tendency to veer off to the side of the hand holding the compass when they are land navigating, especially at night. You could try to compensate by switching which hand you are holding the compass with periodically during that leg of the trip. You could try keep in mind that you veer off and try to compensate. Or, you can just assume it will happen and aim a few degrees opposite of the direction you know you veer. This mostly happens with "dead reckoning" which means you are using your compass and not some distant landmark to stay on your azimuth. There are times you can aim a few degrees off during the day when you are walking towards a landmark far away. For instance, if, after looking at your map, you see that your destination is 35 degrees and 650 meters away from you, you could try to keep a pace count and try to stay on azimuth and hope you have kept track of these two things properly and your target will be right where you think it should be. Another method is to see if there is something close to your target (but maybe a few degrees left or right of it) that you can see from your starting point that is also on your map (hill top, tall church, road intersection.) You can easily find and go to that reference. Once you are there you have a much shorter distance to travel to get to your actual target. This gives you a better chance of finding it b/c your pace count is more accurate the shorter distance you go and you will not have as much of an opportunity to veer off your azimuth. Navigation - be it either over land or sea - is governed by non-Euclidean geometry, which means dealing with a sphere instead of a plane. This also means that shortest path between two points on a sphere will never be straight line (unless you can dig really fast). This shortest route is called orthodrome. When bearing is designated by compass only we pass every meridian at a same angle (as all meridians converge on the poles), which means we're traveling along the loxodrome (except for bearings due north or south or when travelling along the equator). Aiming slightly to the either side of the compass-designated bearing (which side obviously depends on which direction you're travelling to and which hemisphere you're on, I think) allows to compensate for the loxodrome and to come closer to the orthdrome route, which means you have to cover less distance. The longer the distance, the bigger the difference. As obviously, this one starts to matter at distances greater than 6 km, which is when curvature of the Earth's surface starts to become noticeable. 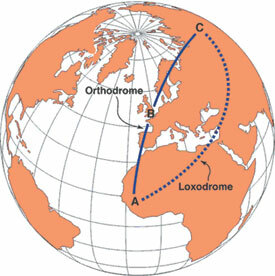 However, maritime navigation says that going over orthodrome gives benefits over the loxodrome on the distances over 500 nmi. Not the answer you're looking for? Browse other questions tagged navigation orienteering or ask your own question. I am lost, I found a trail, which way do I go? What is a catch feature in orienteering? If I lose my compass, what is the easiest way to identify and follow a heading? Is a smartphone or dedicated gps receiver better for navigation in the desert? What Navigation Aids can I make on an island with only a knife? How to triangulate your position with a map and compass? How to temporarily mark a trail? I have a compass but no watch, how can I tell when it will get dark? How to identify latitude & longitude with a compass? Can you find your location using the angle between compass bearings? What is a back bearing when navigating with map and compass? What does contouring mean in the context of navigation/orienteering? How to not starve gigantic beasts? Would it be suitable for Zhentarim to order PC member to find Arctus Simber in the Tomb of Annihilation adventure?